There are 36 official neighbourhoods in San Francisco. That’s already a lot for such a small city, and when we say “official” we’re not even talking about the mind-blowing number of other districts and micro-hoods you’ll come across here. What makes these neighbourhoods so special is just how diverse they are, making San Francisco such a unique place to explore. But what if you’re visiting for the first time? Where do you focus your travel time and energy? Founded in 1776, the Mission is San Francisco’s oldest neighbourhood and also one of its most diverse. This is where you’ll find the highest concentration of culinary hot spots in the city, but this hipster ‘hood is also one with deep Latino roots, which you can see in the mashup of cool cafes, bars, taquerias and Latin produce markets. Make your way here for some of the best food in the city (from destination restaurants to cheap, hole-in-the-wall eats), but stay for the murals, which adorn blocks upon blocks of building facades. Scoping them out can make for a low-cost way to spend a couple of hours exploring — consider it a DIY al fresco art tour. 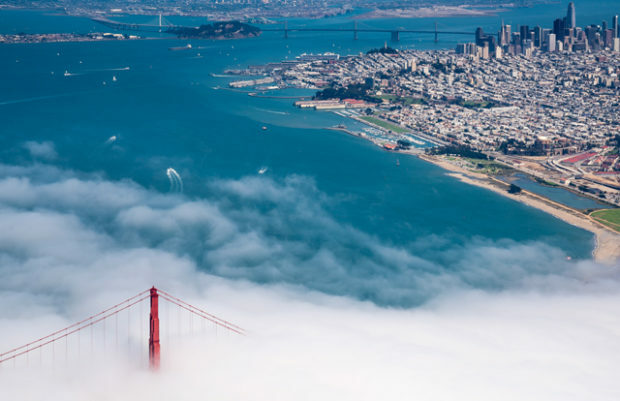 Other things to do: Hit up Dolores Park, a favourite among locals; shop the quirky Pirate Supply Store where you can pick up essentials like pirate hats and pirate flags; take in a flick at the Roxie (San Francisco’s oldest theatre), or save your energy for the evening to bar-hop your way through the area’s many drinking spots. 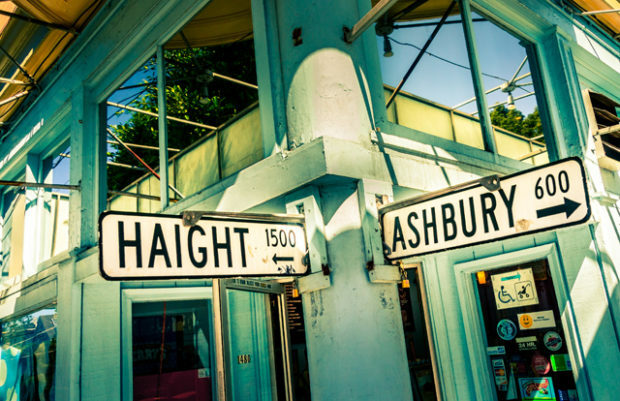 If you want to visit the birthplace of hippie culture and see where the 1967 Summer of Love started, make your way to Haight-Ashbury. 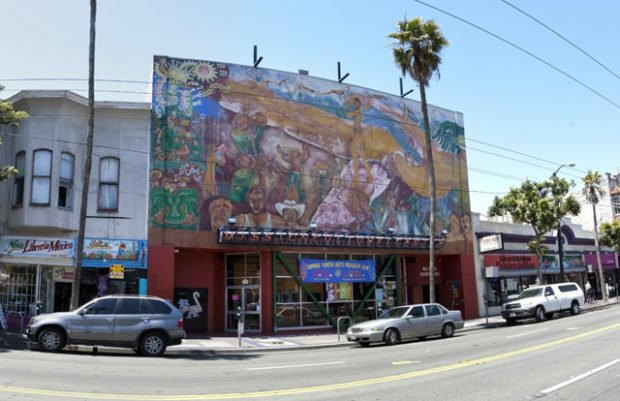 This is where Janis Joplin, The Grateful Dead and Jefferson Airplane hung out, and, although that iconic era has long-passed, you can still feel some of this ‘hood’s hippie roots. The area is home to many funky bars and cafes, as well as vintage stores, bookshops and record stores. Other things to do: Spend some time browsing Amoeba Music, the world’s largest independent record store; make your way to Hippy Hill, a spot where you can still feel some of the hippie culture of bygone days; and although you can’t go in, you can still check out the Grateful Dead House. This neighbourhood is noted for its friendly atmosphere and small-town feel, as well as for being slightly off-the-radar, making it a good spot for anyone looking for a more leisurely pace. But that doesn’t mean you need to worry about being bored. There are new bars and restaurants popping up on Cortland Ave. – the area’s main shopping street – so you won’t be hurting for things to eat, drink or buy. 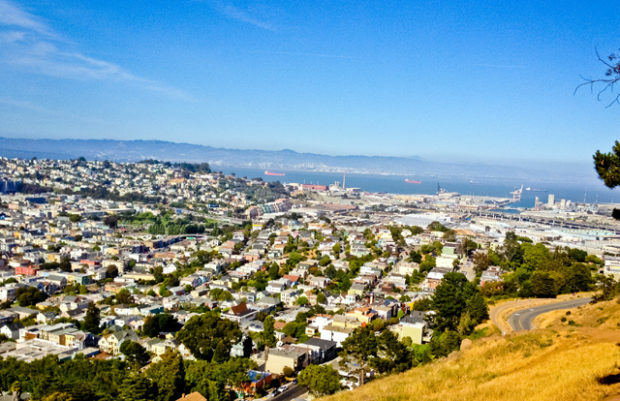 While you’re there, you’ll definitely want to climb to the top of Bernal Hill for some 360-degree panoramic views of the city. Other things to do: Depending on when you’re visiting, hit up Alemany Farmers Market on Saturday mornings or the Alemany Flea Market on Sundays and mingle with the locals. 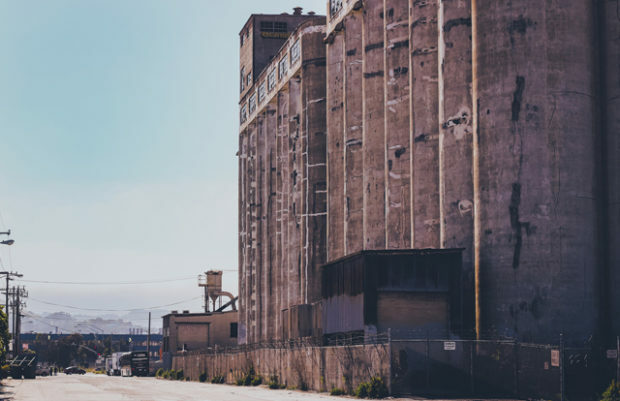 Dogpatch is comprised of a mix of old factories and historic warehouses that fell into disrepair but are now being converted into artist studios and collaborative spaces filled with local designers, makers and entrepreneurs. The vibe here is on the artsy side, with an emphasis on independent boutiques, cafes and restaurants. This is a great area to shop for cool clothes and keepsakes that you won’t find at home. Other things to do: Explore the Museum of Craft and Design, hang out by the water at Warm Water Cove, or do some shopping for unique housewares and apparel at Workshop Residence. Fisherman’s Wharf is jam-packed with some of San Francisco’s top attractions, so head here for a one-stop-shop of things to see and do in the city. 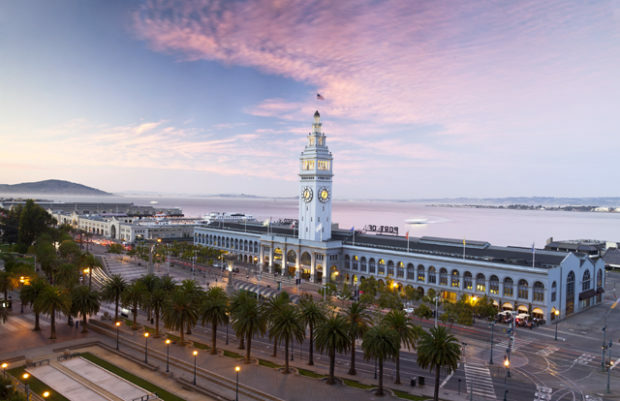 This area puts you within close proximity to the Maritime Museum, PIER 39 and its 45 acres of shops, restaurants, live music, street performers and more; the Hyde Street Pier, where you’ll find several historic ships; and Ghirardelli Square, home to shops, pubs and restaurants. Other things to do: Take a cruise around the bay or sail to Alcatraz. There’s an industrial feel to this expansive San Francisco ‘hood, thanks to warehouses that have been converting into lofts, galleries, nightclubs and pubs. 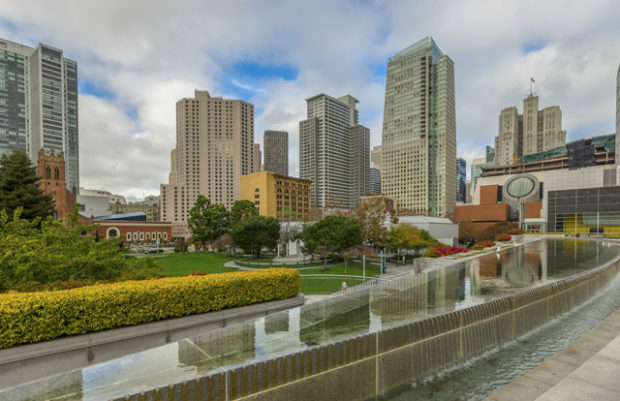 But this is also where you’ll find many of San Francisco’s museums, including the San Francisco Museum of Modern Art, Yerba Buena Center for the Arts and the Cartoon Arts Museum. Baseball fans take note: This neighbourhood also has AT&T Park, home of the San Francisco Giants, 2012’s World Series Champions. Other things to do: The SoMa StrEat Food Park is where to go for an expansive selection of food trucks, but also beer, wine and carnival games. There are even heat lamps to warm you up on colder nights. Not only is this the largest Chinatown in North America, it’s also the oldest Chinatown outside of Asia. Here you’ll find all of the hustle and bustle you can expect from a Chinatown, as well as streets filled with exotic shops, food markets and produce stands, temples and spots to fill up on tasty dim sum. 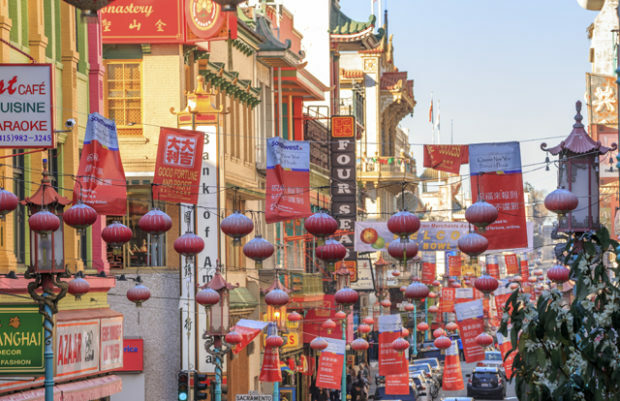 Other things to do: Learn more about the history of Chinatown with a visit to the Chinese Historical Society of America and the Chinese Culture Center, or take a tour of the Golden Gate Fortune Cookie Company. Leaning against each other, Nob Hill and Russian Hill are unsurprisingly some of the hilliest ‘hoods in San Fran. 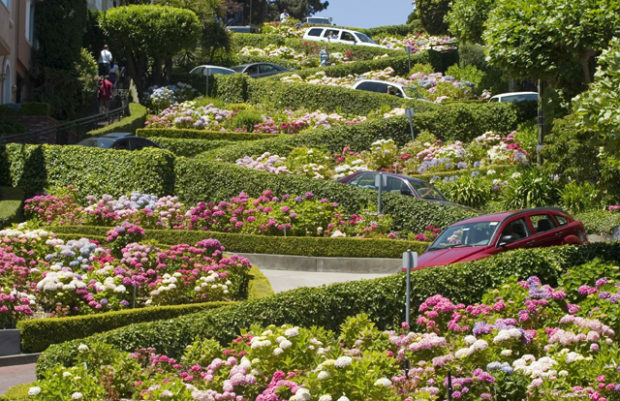 Explore some of the most scenic streets in the city, including famous Lombard Street, dubbed “the crookedest street in the world”. The best way to get around is via cable car. Take the California line for Nob Hill and the Powell–Hyde line for Russian Hill. Other things to do: Visit the San Francisco Art Institute, hang out in quiet Ina Coolbrith Park, or check out Macondray Lane, two blocks of cute cottage-like residences and narrow paths. 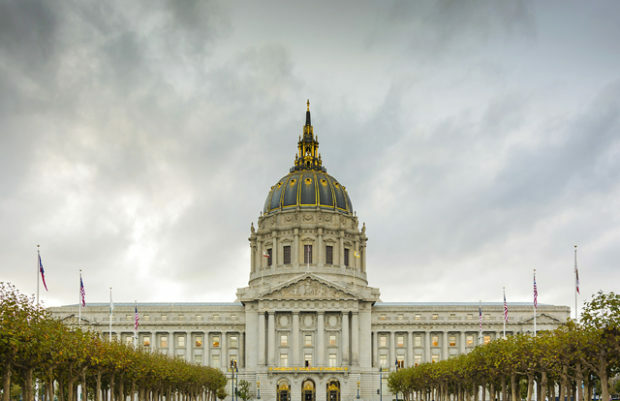 Home to San Francisco’s massive City Hall, Civic Center is also where you’ll find many culturally significant buildings including the SFJAZZ Center, San Francisco War Memorial and Performance Center, SNH Orpheum Theater and the Asian Art Museum. Civic Center is also home to two plazas: United Nations Plaza and Civic Center Plaza. UN Plaza is where you’ll find the Heart of the City Farmers’ Market every Wednesday and Sunday as well as Off the Grid’s food trucks, which set up every Tuesday and Thursday from 11am to 2pm. Other things to do: You can find art exhibits presented by the SF Arts Commission on the ground floor of City Hall that are free and usually worth checking out. Bordered by two parks, Golden Gate Park and Presidio, Richmond is the ideal neighbourhood to base yourself if you want to spend some time in the great outdoors. Golden Gate Park is comprised of over 1000 acres of gardens, lakes (10 to be exact), playgrounds, trails, a golf course, the de Young Museum and more. Presidio is where you’ll find nearly 40 kilometres of hiking trails and has eight scenic overlooks for snapping some seriously Instagram-worthy pics. Richmond also puts you close to Ocean Beach where you can go to watch surfers hit the waves. Other things to do: Fill up on Asian eats along Clement Street where you’ll find everything from dim sum to Malaysian food.